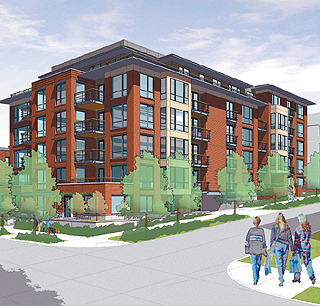 Lorig’s 200 West Highland project slated for upper Queen Anne in Seattle. "Soured condo market in Seattle? Think again"
Even Portland has delivered more housing units in a market that’s half our size. "New condos shape up old Tacoma neighborhoods"
The city is zeroing in on its goal of creating 2,010 market-rate residential units by the year 2010. "Conversions preserve history, fill affordability gap"
Condo conversions help provide an affordable option in neighborhoods that may be otherwise financially inaccessible. "You don’t have to give up the single-family style"
With paired homes, owners can get a sense of living in an individual house. "It’s what’s inside condos that counts"
Living space is ultimately what residents bond with as time goes on. "Make sure your high-rise is breathing easily"
Close cooperation between architects, engineers and contractors is needed to ensure ventilation systems function properly. "Smart urbanites step up to mid-rise condos"
larger floorplans and more pedestrian-friendly environments. "Mixed-use condos make good business sense"
"Why developers should check out the burbs"
Many suburban condos are built on less expensive land, have a small-town feel and are close to abundant local amenities.